Dog Site: Can you Tell a Puppy's age by its Teeth? Can you Tell a Puppy's age by its Teeth? The answer to this is, of course, yes, up to a certain age, but after the full set of permanent teeth has been acquired, it is only guesswork. A puppy is born with no teeth; between two or three weeks he gets his milk teeth, which are very sharp, and does not begin to lose these teeth until between three and five months old. At six months the permanent set of teeth should be complete. The changing of the teeth begins with the upper and lower incisors. It is amazing how quickly and unobtrusively a puppy loses its baby teeth and gains its permanent ones. Occasionally a permanent tooth will come down before the baby tooth has fallen out. If it is loose, you may be able to give the baby tooth a little tug and it will come away easily. Otherwise, get your vet to pull it out for you. It is important to examine a puppy’s mouth quite often during teething to make sure nothing like an abscess is forming or food is impacted when a baby tooth has fallen out. The examining of the mouth at frequent intervals is not only a safeguard against teething troubles, but a first-class way of accustoming the dog to have its mouth examined at shows later on, to taking medicines by mouth, and to having its teeth cleaned periodically. Frequent handling of a puppy’s mouth makes it “soft-mouthed” so that it won’t nip so hard when playing with its owner. 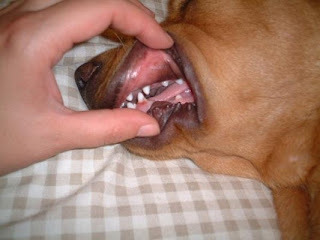 Baby milk teeth can do a lot of damage to the owner’s fingers and arms even though the puppy is only playing. As the dog grows old, the teeth deteriorate and become discolored if not properly cleaned and scaled. This cleaning and scaling should be done regularly throughout the dog’s life. Your vet or dog’s beauty parlour will do it for you. Few private owners are capable of carrying it out at home. A rag soaked in 10% volume hydrogen peroxide has a bleaching effect. The gums should be watched to see there is no overgrowth of gum caused by tartar on the teeth. If this “hanging down” of a piece of gum does occur, your vet will anesthetize it and cut the gum back. This does not occur in puppies, only in older dogs. The age at which your puppy should have his teeth cleaned can not be forecast. Probably few dogs need this service until over the puppy stages. Bones help to clean the teeth and keep the gums healthy and free from pyorrhea. But the bones should be large marrow bones, not game bones or small bones of any sort.